Around 40% of the final energy in Germany is consumed by the building sector. About 85% of it is used for heating and hot water preparation. However, many heating boilers both in the private and public sector are outdated. Installing an efficient fuel cell heating system could save a great deal of energy and reduce CO2 emissions. In 2015, a total of 710,000 heating systems was sold on the German market, four percent more than in the previous year. In light of the tremendous size of the market, the federal government chose to act and support the integration of state-of-the-art heating technology, whether this has meant providing financial assistance for installations of gas, wood or pellet boilers, heat pumps or mini-CHP plants – and now also fuel cells. In principle, the grant amount in support of the retrofit is the higher the greater the energy saving will be. The right government agency to ask about the numerous already established support programs is the Federal Office for Economic Affairs and Export Control (BAFA). It will even subsidize the recommended first consultation at one’s local energy consultant. Fuel cell heating systems are typically eligible for more than one type of funding: For example, buyers of CHP systems with an electrical capacity of up to 20 kW can receive a one-time investment grant. But since the new KfW program no. 433 was specially designed with fuel cells in mind (see German Government Launches FC Subsidy Program) and because its financial support cannot be added to the one-time grant offer, customers should choose the new “Fuel Cell Grant” from now on. The existing mini-CHP grant, however, is still suitable for systems which are not eligible for funding through program no. 433. The financial assistance depends on the system’s electrical capacity and ranges from EUR 1,900 to EUR 3,500 (see Table 1). This base support comes in the form of a fixed and non-repayable grant. Additionally, there is the “Heat Efficiency” bonus of 25% of the associated base grant for heating systems which are equipped with a condensing heat exchanger and had their hydraulics calibrated. Systems such as fuel cell heaters, which also possess high electrical efficiency, will receive an additional bonus for “Power Efficiency,” which is 60% of the base grant. Overall, buyers of 1 kW modules can take up to EUR 3,515 off the purchase price. 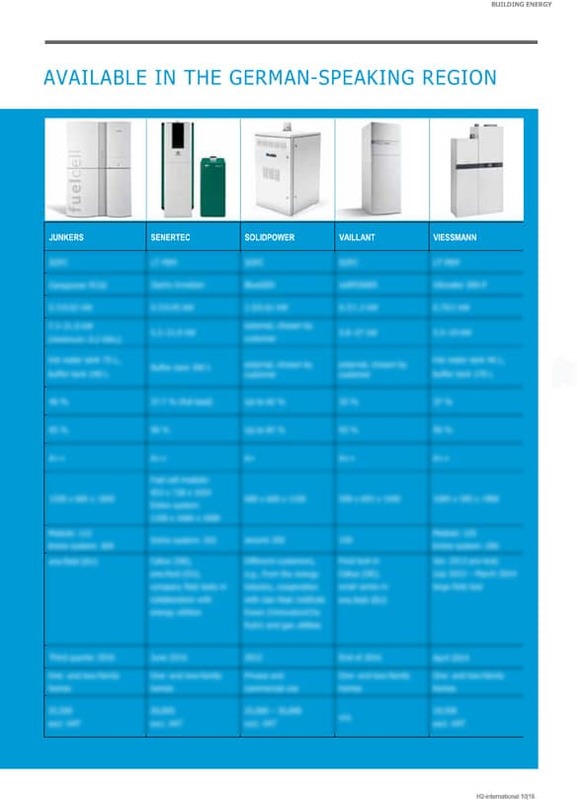 However, first of all, a system needs to be on the BAFA list showing all eligible CHP plants of up to 20 kWel capacity. Additionally, the grant application must always be submitted prior to the purchase. The new regulations, however, had until recently been awaiting approval by the EU commission. BAFA was able to accept applications, but could not issue preliminary and regular permits for CHP plants going online after Jan. 1, 2016, until EU approval became available. There are still other reasons to consider fuel cell heating systems for energy supply: For example, the new Energy Savings Ordinance (EnEV) stipulates that principals must have new residential buildings constructed in an energy-efficient manner, something that will be verified in conjunction with the building application. The key energy efficiency figures limited by EnEV 2016 are the annual primary energy demand and the heat loss of the building envelope. The allowed demand for primary energy was cut down by another 25% in 2016. The Working Group on Efficient and Environmentally Friendly Energy Use (ASUE) dedicated to the utilization of efficient natural gas technology showed that the investment was worthwhile even without financial support, as the cost of consumption and operation play important roles in addition to the price of the initial purchase. ASUE estimates these costs to be the lowest for fuel cell systems (see image). They had been comparably high until now, but the new grant program has reduced those costs considerably. SOLIDpower has postponed the marketing of its fuel cell heating system Engen-2500 for the moment. After the takeover of Ceramic Fuel Cells, managing director Guido Gummert has put the focus on the further marketing of BlueGEN. 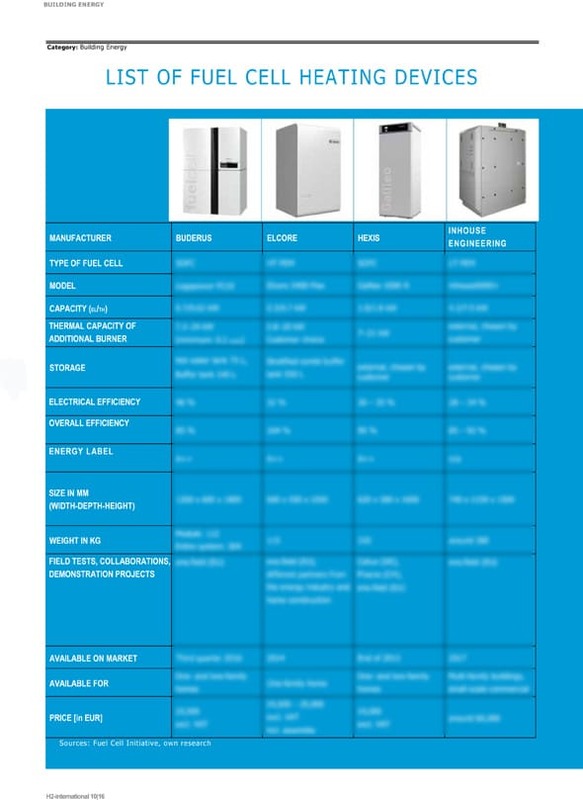 This was also the reason behind IBZ’s decision to take the 2.5 kW unit by the Italian manufacturer off its device list. Elcore leaving the Initiative Fuel Cell this summer came as a surprise to many. The company announced it was rethinking its business model and was planning to “try out a new strategic approach” as well as “look for new collaboration partners.” This means that the IBZ does no longer include any fuel cell-only manufacturers, but only traditional heating system producers. Japan’s aggressive financial support policy has so far resulted in the installation of more than 150,000 stationary fuel cells. The aim of the Japanese government is to have around 1.4 million units on the market by 2020. In Germany, the Initiative Fuel Cell plans to have 175,000 units available by then.